This is an early example of a Cherry Red, Double Cutaway "Junior" model Les Paul. 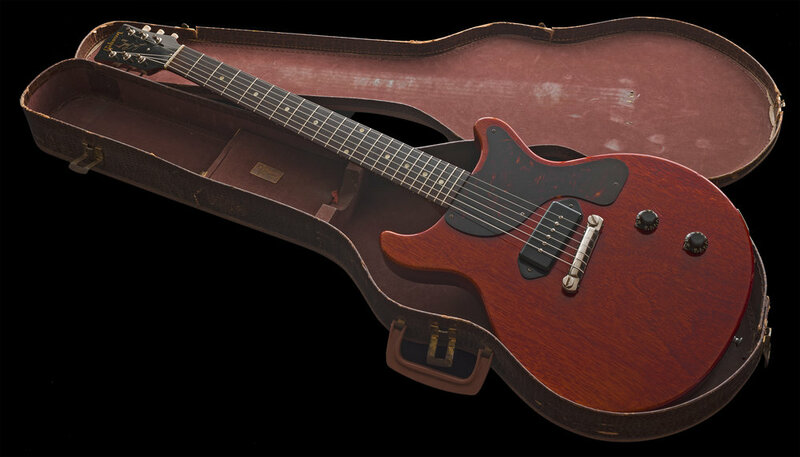 Gibson first added the "Double Cutaway" models, which also features the introduction of a "Cherry Red" finish to their line up for the very 1st time, in mid 1958, which was also a year of many big changes at Gibson. There were several ground-breaking new model introductions as well as major model redesigns, like the JUNIOR. The Cherry double cut models began shipping sometime early in the 3rd quarter of 1958 and this example was built during an early production run of the model. The newly "redesigned" model was in full swing by 1959 and was presumably really getting noticed as 1959 yielded more Junior units shipped than any prior or subsequent years, we can assume the updates were a hit and to me, the beauty and attraction of these guitars is still strong today! I have examined, tested, serviced and set-up this instrument and found it to be factory-correct and unmolested in every way. All of the electronics, frets, nut, tuners, finish and both the plastic and nickel-plated metal hardware are all correct and original to the guitar. The 2 potentiometers are matched and dated the 8th week of 1958 and it has a bumble bee capacitor attached. There was a short period during 1958 when the Gibson Serial number stamp omitted the first digit of the 5-digit serial which is an "8", and it rendered quite a few 1958 production instruments with just the last 4 digits, and this is 1 of those examples. Luckily, this guitar has not had any repairs, parts restoration or any modifications, it is still factory-original with excellent condition fret work. The back of the body has minor impressions into the wood and some expected signs of usage, but it's minimal and has not detracted from the inviting appearance of this vintage Gibson. Globally, the guitar displays small marks, some of which the large, clear photos will show and often, and even with intelligent photography, it is not possible to show every cosmetic tick. The Cherry Red, aniline dyed finish has faded slightly to an attractive Medium-Cherry / Orange hue. The CASE it is resides in came with the guitar. It is of a similar style and construction to an Original Durabilt Les Paul case, but the body shape of it indicates to me it is from a 1965 double cutaway Melody Maker. The case is in "Fair" condition with a functioning handle, latches and hinges. Many of the "intermediate" guitars were sold with the lower priced soft-shell cases and they generally did not hold up very well to time and normal usage, being made of a Heavy Paper product. This particular case is still better than many that I have owned, but in my opinion it is not in strong enough condition to be used for transporting the guitar out of the house, but is fine for storing the instrument. The guitar has just been set up with a set of D'addario XL's 10 - 46 gauge strings. I acquired this guitar approximately 25 years ago and really liked it due to it being a 1st year, early Double Cut production example. The body is constructed from a beautiful 1 3/4" thick 1-Piece, Honduran Mahogany slab. One of the features that I am enamored with and unique to a 1958 Double-cut Junior model is the body shape. These 1st year models have less round-over on the body edges giving them a more "square and chunky" look that I am personally fond of, and I put this one away. This guitar is now 60 years old and has been in my personal collection for 25 years and has been spared all of the "circulation" that most instruments being offered online today have undergone. If you have any interest or questions, kindly do inquire.